Do, re, mi. Such singular small notes, and yet when combined with other small notes we get arias, million dollar songs, and so much more. When you combine those small notes the possibilities are endless. The same is true with A,B, and C. They give us a word, then a sentence, a paragraph, and a new novel. Sometimes we get so overwhelmed by where we want to go that we forget there are a bazillion little steps which will get us there. When I first began homeschooling my children I learned this lesson. As we began our schooling I panicked about teaching high school. I became scared of even beginning, but then I realized it would be best if we started where we were…with Kindergarten. When I first began taekwondo eighteen years later, I had to relearn the lesson. I wanted to be able to teach self-defense and protection, and I wanted to do it right then. When I realized that would not happen immediately because I had to be at a certain level to speak with authority, I nearly gave up. I was scared if I couldn’t do it then, I would never be able to do it. When I realized that each step would prepare me I relaxed and began stepping. It was similar to my homeschooling lesson, yet slightly different. Now, we can get overwhelmed with the bazillion number, and we can get frustrated that we have to relearn lessons but both of those truths are actually on our side. As we take all the little steps between now and the realization of our dream so many things will happen. We will learn, and grow and become someone different. Each step will help us become the person who can handle doing what it is we dream of doing. We might even change course in the middle, and since we took small steps we have the ability to change course easily. When we are given an opportunity to relearn a lesson it almost always goes deeper or changes a little in fashion. We learn it from a different perspective, or are shown something we completely missed the first time. It is never a wasted opportunity or a negative when we realize it is taking us in new directions. What amazing opportunities we are given in our small steps and relearning. Whatever it is you are setting out to do know that between here and there are a bazillion little steps. Enjoy each and every one because they are all amazing. And you will find yourself relearning a few things along the way. That is so much more than okay! It allows you to deepen and strengthen your understanding. After fourteen years of homeschooling we are finishing the last semester of our schooling. I am amazed at how far we have come. From A, B, C to Chemistry, American Government, and Economics. After two years of classes I have reached the beginning teaching level in taekwondo. From basic steps, blocks, and kicks to katas, self-defenses, and one steps. If it weren’t for each step along the way I never would have gotten to this point. The entire process can seem long and hard, but it is also wonderful and amazing filled with opportunities and blessings. Recognizing this will change how you see the journey towards your goal. Previous postBrave Starts Here…and a giveaway. This reminds me of the movie “What about Bob?” and the “baby steps” idea! Such an important perspective to have. Thanks for your example and your words of encouragement. I need to hear them! Oh it has been YEARS since I have seen that movie. I can’t even remember it, so I must need to watch it again. 🙂 Thanks sweetie. I think we all need encouragement on a regular basis! Thank you Stacey! I enjoyed this! very encouraging. Beautiful post, with great real life examples, Stacey! I was thinking, last night as I lay waiting for sleep, that even the really hard painful things in my life, God has used to create a more Christlike character in me. And so … while I haven’t learned to always appreciate pain in the moment … I can say thank you for the lesson once I make my way through it! I love your title “Getting From Here to There in a Bazillion Steps.” I have always loved the word bazillion! Why is it in our nature to want to skip so many steps? Speaking for myself, so often I think reaching what I think is my goal is going to bring the greatest satisfaction. When in reality, the whole journey brings amazing, challenging, exhilarating, tough, fun, hard, exciting LIFE adventures. 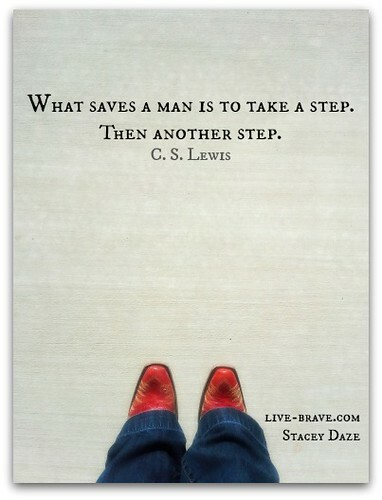 Learning to take the first step (of many) and then not skip steps in between is living BRAVE. You are right Stacey, recognizing the opportunities and blessings along the journey changes our perspective and allows us to live brave. Great post! Thank you! Remembering the journey is where the fulfillment lies can be challenging, and hard to believe, until you have experienced it. Thank you, Melanie! Oh yes, yes indeed! When I was younger, it was harder to embrace baby steps. I wanted to make giant leaps! But now I see the value. Great first BRAVE post, my friend! Now I stroll and take in every moment, I stop to breath in deep and thank the Lord for breath itself. Now I skip and laugh along the way, now I run to make sure I do not miss a moment that I took for granted in the past. Now I live and am so thankful for the bazillion little steps that got me to this place of discovery and presence. Thank you Stacey for helping us to recognize that connecting the dots can only be done, when we move from one dot to the other. Thank you Lesley. So much.